Stuffed Mushrooms from Chef D of the BGE Culinary Center. 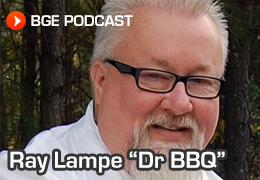 Dr. BBQ prepares a delicious Pork Chop Sandwich with Grilled Onions! Dr. BBQ prepares a stunning Florida Lobster Roll cooked on the Big Green Egg. Cedar Planked Salmon with Grilled Peaches and Soy Ginger Vinaigrette.